A Trench is a defined as a soil treatment and dispersal system, the absorption width of which is 36" or less. Trenches are narrower than they are wide, no wider than three feet, and are laid out along the contours of the soil. The method of distributing the septic tank effluent can be either pressure or gravity. The trench soil treatment system consist of distribution media, the bottom of which must not be deeper than 48 inches, covered with a minimum of 12 inches of soil and a close-growing and vigorous vegetation. Many Trench systems utilize a pipe and a gravel distribution system where effluent passes through the pipe and is stored within the media until it can be absorbed into the soil. An At-Grade, as its name implies, is a system installed with the distribution media placed at the original soil surface. It is designed to solve similar issues as the mound, but where the soil conditions are somewhat more favorable. The operation of the at-grade component is a two-stage process involving both effluent treatment and dispersal into the underlying soil. Treatment is accomplished predominately by physical and biochemical processes within the soil. These processes are affected by the physical characteristics of the effluent wastewater, influent application rate, temperature, and the nature of the receiving soil. The At-Grade component contains a septic tank(s), pump tank, Distribution system that consist of distribution media and a pressure distribution system, which is installed directly on top of the plowed natural soil and covered by loamy or sandy cover material and topsoil. Effluent flows into the soil, where it undergoes biological, chemical, and physical treatment and dispersal into the environment. The natural soil serves as the treatment medium and disperses the effluent into the environment. Mound systems were developed in the early 1970s to overcome soil and site conditions, which limited the use of trenches and beds. Limited conditions include high water tables, shallow soil depth to bedrock, slowly permeable soil, or soil too coarse for treatment. 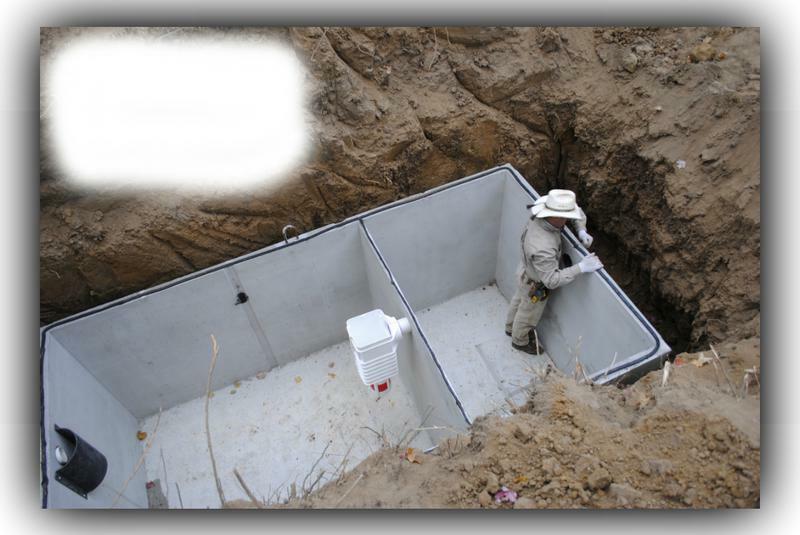 A sewage treatment mound is nothing more than a seepage bed elevated by clean sand fill to provide adequate separation between where sewage effluent is applied and a limiting soil layer. The mound system consist of a septic tank(s) followed by a pump tank. Effluent is dispersed evenly via the pump into the absorption bed, where it flows through the clean sand material and undergoes biological, chemical, and physical treatment. It then passes into the underlying soil for further treatment and dispersal to the environment. A minimum of 12 inches of cover material which is crowned to shed water is placed over the top of the mound with the upper 6 inches being top soil. Traditional septic systems are typically thought of as an on- site sewage treatment system serving one household with a drain field or mound. These are probably still the best way to treat sewage when space and good soil conditions exist. When properly designed, installed, operated and maintained, they treat sewage as well as or better than municipal treatment systems. When space is limited or soil conditions are poor (wet or close to the water table), homeowners may need to consider a modified treatment system. Because a typical septic system does not remove all of the nitrates from sewage, additional treatment steps may be used to reduce or eliminate them. These options may be considered for individual homes or multiple household units. Typically, alternative treatments provide "pre-treatment" of septic tank effluent before it enters the soil of a drain field or mound. These pre-treatment systems include containers using sand, peat or gravel as a medium where filtration and biological degradation of fine solids, pathogens and nutrients occur. The containers may be manufactured or assembled on the site. The effluent in a pre-treatment system usually passes through the system one time, but some systems collect and re-circulate the effluent several times. These systems often require more space than a traditional drainfield or mound. Research has still to determine if the size or the separation distance of the drain field receiving the pre-treated water will be able to be reduced. These same considerations are being made when aerobic septic tanks are used to pre-treat waste water. Alternative methods of dispersing septic tank effluent into the soil are also being tested. These include drip irrigation over a large soil area, particularly appropriate in shallow bedrock and high water table situations. Spray irrigation onto the soil surface is another option, but presents special health risks with potential human contact. Uses of the water for watering lawns and golf courses also offer opportunities to recycle the water. Separation technology is another concept in alternative treatment for individual homes. The idea of separating the solid wastes from the toilet and delivering them to a composting unit reduces household water use up to 40 percent and removes many of the pathogens and nutrients from the system. Some systems use worms, while others use bacteria and aeration to accomplish the composting process. Homeowners are sometimes reluctant to have a bin of composting wastes and even worms in their basements. The composted materials must be removed periodically. Alternative treatment systems will always require increased attention to operation and maintenance. As the treatment becomes more sophisticated and technical, the need for monitoring of its performance increases. Multi-household installations must have a functional management plan. Most alternative treatment systems require special permits for their design, installation and operation. Any system discharging to the surface must have a State Disposal System permit and any system discharging 10,000 gallons per day must have a National Pollutant Discharge Elimination System permit. Both require on-going monitoring. Information about permits is available from local planning and zoning or environmental service offices. "LET OUR YEARS OF EXPERIENCE AND PASSION FOR THE BUSINESS WORK FOR YOU TO ENSURE YOU GET THE BEST YOU CAN"